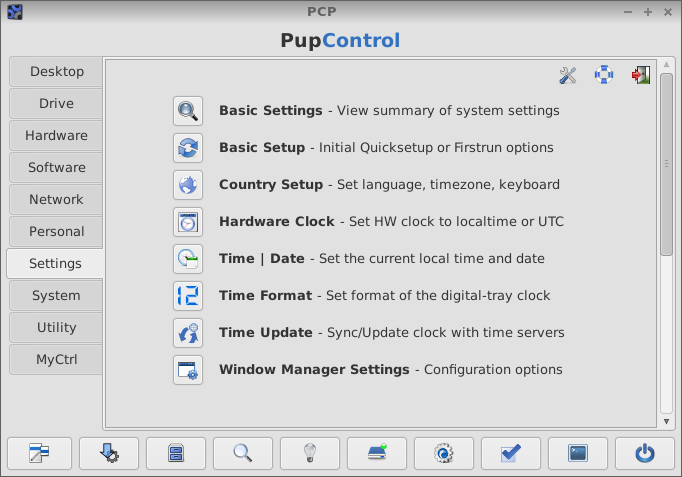 PupControl Panel is a graphical control panel which permits menu-like access to more than sixty Puppy control functions, and is similar to the companion program, PupApps Launcher, which permits quick access to most Puppy programs (applications). The control panel is a standalone program but will integrate seamlessly with PupApps, PupMenu, pRun and PupShutdown. The tab interface of PupControl sorts all programs and utilities into nine broad categories, and common functions that one may use routinely are available in the lower panel tray. The optimal display for the panel GUI is automatically configured based on the active window manager and current global screen dpi. 1 - Buttons for Help resources and Preferences are available in the top-right corner of each page of the main user interface, providing quick access to program configuration options. 2 - When first installed, the PupControl GUI displays applications that are standard in most Puppy versions. Alternate programs may be selected in Set->PupControl Preferences. If a desired application is not listed, you can enter the name of the executable, including the path and switches if needed, then select Save to set your new option. The MyControl module provides the option to add user-selectable favorite applications to the PupControl GUI. 3 - The category icons in the main GUI, and program options in the Preferences drop-down lists, change dynamically as applications are installed and uninstalled. After uninstalling an application, the name of that program remains in the Preferences drop-down list until you select and save a different application in that category. If only one application remains in a drop-down list and you wish to remove it, simply highlight that name with the mouse cursor and click the delete key on your keyboard, then select Save in Preferences. 4 - Quick program access is by Puppy Menu->Utility->PupControl, or by the default Ctrl+Shift+C keyboard shortcut, which is configured for IceWm, JWM, Openbox, Fluxbox, LXDE and LXPanel. If the Xfce window manager is currently active, the hotkey can be set manually in the PupControl Settings tab as follows: Window Manager Settings->Xfce Settings->Keyboard->Application Shortcuts. 5 - PupControl auto-configures many panel options based on the name of the current window manager logged in /etc/windowmanager. Puppy will update this file automatically when starting a new window manager from the command prompt, but some programs that change the window manager in real time may fail to update properly. Consequently, when you change to a different window manager, if PupControl does not display properly, or command functions are inoperative, please exit to the command prompt and type in the appropriate start command such as xwin icewm, or xwin jwm, or xwin lxsession, or xwin startxfce4. 6 - PupControl-3.2.2 supports screen fonts as large as 108 dpi in standard Puppy derivatives, and up to 120 dpi in Lighthouse Pup, in 6-dpi increments only. Font metrics of the Fluppy and Puppeee derivatives are no longer supported. Desktop options and configuration settings may vary depending on the current window manager. PupControl is configured to call the programs appropriate for the active window manager. and this one is just awesome..
-Supports Debian, Slackware, T2 and Ubuntu derivatives of Puppy. -Supports popular window managers such as IceWM, JWM, Fluxbox, Flwm, LXPanel, FBPanel and Openbox. -Supports popular desktop environments such as DuDe, KDE3, KDE4, LXDE and XFCE. -Added support for the Fluppy and Insidious derivatives of Puppy. -Added descriptive page which lists supported applications. Just a quick one to point out that the hyperlink to PupApps in the first post needs updating. Version 1.2. See main post. -Enhanced the virtual desktop option in PupControl to support both legacy and 498+ versions of JWM. -Enhanced the Shutdown Manager to comply with most Puppy derivatives. -Moved the PupControl uninstall option to Shutdown Manager. -Added Touchpad subcategory, which displays if flsynclient is installed. -The PupControl GUI now supports screen fonts as large as 144 dpi in both Fluppy and Lighthouse Pup, in 6-dpi increments only. Version 1.3. See main post. -Improved the detection of virtual desktop syntax in legacy and 498+ versions of JWM. -Added support for 01micko's Desktop Setup utility. -Country and timezone options call shinobar's countrywizard if present, otherwise default to chooselocale and timezone-set. -Removed the PupControl uninstall option from Shutdown Manager. Please use Puppy Package Manager to uninstall. Version 1.4. See main post. -Country and Timezone options are combined into a single Country option (Set tab). -Added option for CPU Frequency Scaling (Set tab). -The Desktop Setup utility (01micko) is now displayed only if the Rox pinboard is active (Desktop tab). -Help resources are now quickly accessible on each page of the main GUI (blue help button in top right corner). -Added improved and consistent display of GUI buttons at all screen resolution. Pupcontrol-1.4 is being used in Luci-250 as the setup icon on the desktop. At first looks like a decoration symbol not a button to select. All other buttons are labeled, so a label would probably make it clear what it is. edit: I'll give you a plaque. My objective for the small ‘decorative’ button was to provide quick access to help resources through a universally recognized 'help icon’ - without being too distracting when viewed at higher global font sizes. For me, a label attached to the blue help button becomes significantly distracting when viewed at the higher screen dpi settings that are supported by some Puppy derivatives, such a Lighthouse Pup. However, I'll give additional thought to your suggestion, and I’ll continue to look for ways to improve access to help resources. Thanks for your recommendation bigpup. Thanks for the kind words, and the nice plaque. Version 1.4.1 See main post. -Improved detection of the jwmthememaker executable, the location of which is version dependent. Love PupControl! So much I made an icon and a link on my desktop. I really like your icon - looks great with your desktop background, and makes a very nice alternative to the default icon (control-panel_48.png). Posted: Wed 16 Mar 2011, 10:38 Post subject: select which tab is open on launch? Hi, i'm developing a very minor "puplet" and have been working on cleaning and reordering the menu system. I would like to replace many of the menu entries with simply a link to PupControl, but i would like to be able to select which tab is open by default when PupControl launches (ie Desktop or Manager). Is there anyway to do this? Thanks so much for PupControl. It is very elegant.